There’s a very fine line to walk when a film tries to combine horror with comedy, and a lot of times that formula fails. There are definitely some successful attempts at combining the genres, but the film will ultimately fit into one genre more than the other. A movie like Scream has lots of very witty, self-referential moments, yet the plot is ultimately that of a horror film and it feels as though its goal is to scare its audience. On the other hand, you can have something like Tucker & Dale vs. Evil, which doesn’t really attempt to scare the audience at all, but the jokes are all based on a common horror movie plot and are that much more enjoyable to fans of the horror genre. I had never heard of Eddie: The Sleepwalking Cannibal when I first saw it back in October at the Music Box Theatre’s 24 horror marathon, but since it played really late at night, I ended up falling asleep during part of it. I remember thinking the opening scene was really funny, so now that Eddie is being released on VOD and in select theaters this week, I thought it was a good reason to revisit the horror/comedy. Never trust an artist in a puffy coat! 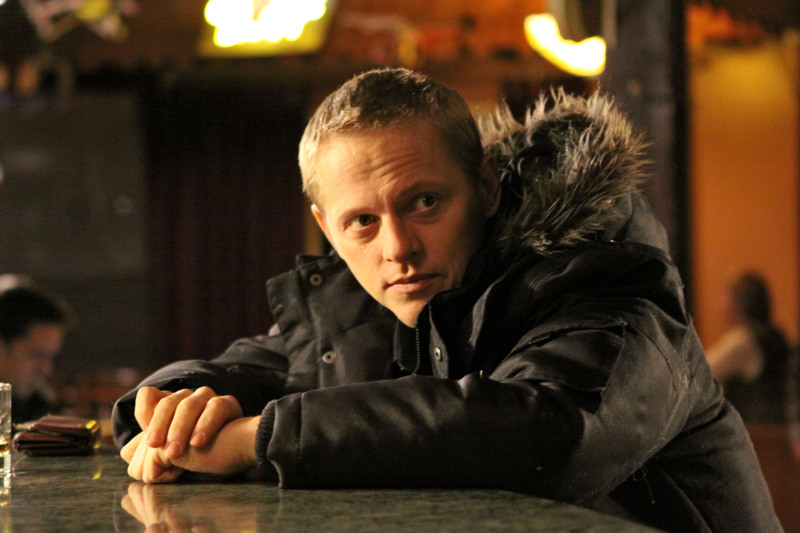 After leaving Denmark as a successful artist to become a professor at and art school in Canada, Lars (Thure Lindhardt) receives mixed reactions from the people of Koda Lake. Local law enforcement thinks Lars considers himself above the law because of his celebrities, his colleagues at the school think he’s pretentious because of his fame, and his boss is just hoping Lars will make a painting that will be sold for an enormous price in hopes of bringing attention and money to the school. The only person who really sees through all of that is Eddie (Dylan Smith), who is far too old to be attending this art school but because of his mental handicaps and donations from his aunt, he’s allowed to hang out at the school. When Lars recognizes the help that Eddie needs, he offers Eddie a place to stay. The only problem is that Eddie sleepwalks, and when he does, he’s known to kill and eat animals. Despite Lars being horrified by this behavior, seeing the blood and gore inspires something in Lars that allows to him overcome the creative block he was having and he manages to sell a painting. Unfortunately, Eddie continues his deadly habits and even starts killing and eating people, leaving Lars to clean up after his mess, which he doesn’t mind because of his successes in paintings. As the story progresses, the movie explores who has more to gain out of this unlikely friendship. Has Eddie finally found someone who’s willing to take care of him and his deadly habits or has Lars finally found someone who can help provide him with inspiration for the mere cost of having to clean up dead bodies? You know that Eddie has some mental issues because he’s not even wearing longjohns! Come on, Eddie! You’re in Canada! I mentioned how hard it is for movies to cross multiple genres, especially horror and comedy, but Eddie does it quite well in how it slowly transitions from one genre to the other. I mentioned that the opening scene was really entertaining, and I won’t give away all the specifics of it, but it involves Lars attempting to put a deer that he’s hit with his car out of its misery and the reaction of the lawman who stumbles across the scene. It’s a great bit of physical comedy from Linhardt and some great delivery by the police officer played by Paul Braunstein. From there, the movie shifts focus from the absurdity of a guy who eats people in his sleep to a story about this unlikely friendship. I’m not going to start reading too much into what the film was trying to say about mental illness, but considering the fact that Lars’s creativity is psychologically linked to blood and carnage, by the end of the film you start question who the “mentally ill” character really is, the cannibal or the one controlling the cannibal. On this second viewing, I can see how I might have fallen asleep during it as there are some pacing issues towards the beginning of the third act, but that’s to be expected when the humor starts to fade and there’s a more distinct shift towards the more emotional aspects of the plot. I know that I’ve called this a horror movie a few times already, but I’m also not even sure that’s an appropriate term, considering the most horrific elements of the whole film were some of the more gruesome special effects. The film takes a somewhat ridiculous concept and puts a lot of heart into it to result in a satisfying film with a bunch of jokes, an emotional story about friendship, and with enough blood to satisfy a horror fan. 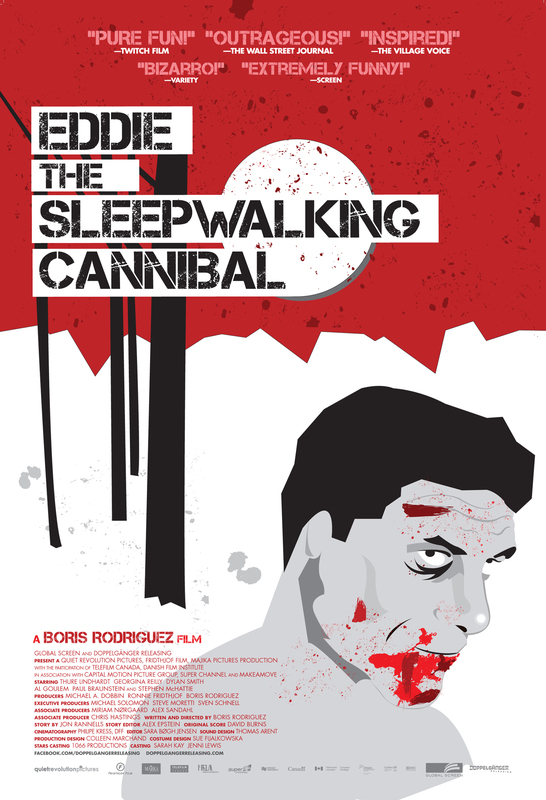 Movie Review: EDDIE THE SLEEPWALKING CANNIBAL! !